I know that vampires aren’t really a big trend anymore, but I still really love them in my fiction. 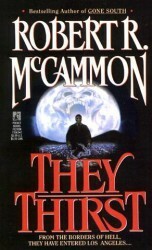 Recently, I read a really great vampire horror novel: They Thirst by Robert McCammon. I love that this book seems to blend classic vampire expectations with more modern ones. It was like the perfect blend of Stoker’s Dracula and King’s ‘Salem’s Lot. There is plenty of horror, suspense, and intrigue to be had in this novel, and I really think it will appeal to lovers of horrors, especially those with a soft spot for vampires.